Conducting in the musical sense means: beating time to help a group of musicians to play well together. In the 17th century orchestras were very small so they did not need a conductor. But as orchestras grew in size it became more and more necessary to have someone in front to lead. The French composer Lully (1632-1687) used to beat time by banging a big stick (like a walking stick) on the floor to the time of the music. One day he banged his stick very hard and it went through his foot and he became ill and died. Conductors usually beat time with their right hand. This leaves their left hand free to show the various instruments when they have entries (when they start playing) or to show them to play louder or softer. Most conductors have a stick called a “baton”. It makes it easier for people at the back of large orchestras or choirs to see the beat. Other conductors prefer not to use a baton. A conductor stands on a small platform called a “rostrum”. To be a good conductor is not easy. It is not just a question of giving a steady beat. A good conductor has to know the music extremely well so that they can hear any wrong notes. They need to be able to imagine exactly the sound they want the orchestra to make. They also have to communicate this to the orchestra so that they know what the conductor wants. Some conductors speak very little during their rehearsals. They make everything clear through the way they conduct. 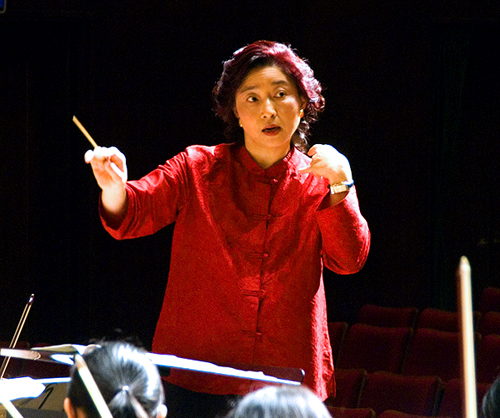 The main conductor who is in charge of an orchestra is often given the title "musical director". This will usually mean that he has a lot of power in the organization of the orchestra. 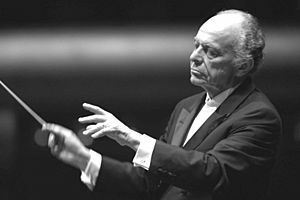 Orchestras may give honorary titles to their conductor such as "conductor laureate". A "guest conductor" is one who conducts an orchestra regularly but is not the main conductor. An "assistant conductor" will often be a young conductor who helps the main conductor and gets the chance to conduct some of the concerts. A military conductor leads the U.S. Navy band during Memorial Day ceremonies held at Arlington National Cemetery. 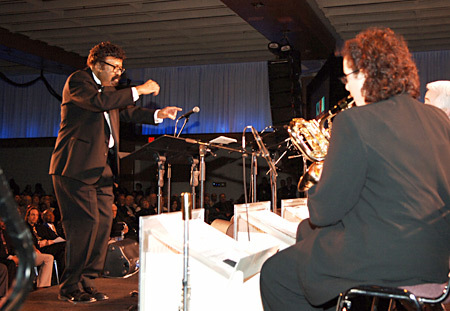 David Baker, a music educator, composer and conductor, (far left) leads the Smithsonian Jazz Masterworks Orchestra during the NEA Jazz Masters awards ceremony and concert in 2008. Conducting Facts for Kids. Kiddle Encyclopedia.